Kelling postmill stood in Hasgate Lane and was set over a roundhouse and had a balcony porch with a gable end roof and a long ladder to the ground. Power was supplied via two pairs of double shuttered patent sails that were struck by rack & pinion; one pair having 8 bays and the other pair 7 bays. The mill was turned to wind with a tail pole attached to two tandem cart wheels. THIS INDENTURE made the thirteenth day of January in the Year of the Christian area one thousand eight hundred and Twenty one BETWEEN ROBERT BARBER of Kelling in the County of Norfolk Farmer of the one part and EDMUND NURSE of the same place Miller of the other part WITNESSETH that the said Robert Barber for and in consideration of the yearly rent hereinafter reserved and of the Covenants and agreements hereinafter contained and which on the part and behalf of the said Edmund Nurse his executors administrators and assigns are or ought to be observed and performed HATH demised granted and to Farm letten and by these presents DOTH demise grant and to farm let unto the said Edmund Nurse his executors administrators and assigns ALL that piece or parcel of land situate lying and being in Kelling aforesaid containing by estimation one rood (be the same more or less) upon which a Wind corn mill hath been lately erected and built by and at the expence (sic) of the said Edmund Nurse TOGETHER with all hedges ditches ways paths passages waters watercourses profits easements and appurtenances whatsoever to the said piece or parcel of ground belonging or appurtaining and now or heretofore used occupied and enjoyed therewith (except and always reserved unto the said Robert Barber his heirs and assigns full and free liberty of ingress egress and regress unto and upon the said premises for all reasonable purposes and in particular to view the state and condition thereof) TO HAVE AND TO HOLD the said premises hereby demised unto the said Edmund Nurse his executors administrators and assigns from the sixth day of April last for and during and unto the full end and term of seventeen years thence next ensuing and fully to be complete and ended and from and immediately after the end or expiration of the said term of seventeen years hereby created as aforesaid and subject in the mean time thereto and in case the said Edmund Nurse shall be then living but not otherwise then TO HAVE AND TO HOLD the said demised premises unto the said Edmund Nurse and his assigns for and during and unto the full end and term of ninety nine years thence next ensuing and fully to be complete and ended if the said Edmund Nurse (aged now about twenty one years) shall so long happen to live YIELDING AND PAYING therefore (sic) yearly and every year during the continuance of this demise unto the said Robert Barber his heirs and assigns the clear yearly rent or sum of five shillings of lawful British money on the sixth day of October and the sixth day of April in every year in equal portions free and clear off (sic) and from all and all manner of present and future taxes charges rates assessments and payments whatsoever by authority of Parliament or otherwise howsoever the first future payment of the said rent to commence and be made on the sixth day of April now next ensuing PROVIDED ALWAYS that if the said yearly rent hereby reserved shall be in arrear in the whole or in part for Twenty one days after either of the days or times whereon the same is reserved to be paid as aforesaid and shall be lawfully demanded upon or at any time after the expiration of the said twenty one days and shall not be paid when demanded or if the said Edmund Nurse his executors administrators or assigns shall do or omit to do any act matter or thing whatsoever in breach or nonperformance of any or either of the covenants and agreements herein contained and which by him or them are or ought to be observed and performed Then and in either of the said cases it shall be lawful for the said Robert Barber his heirs and assigns into and upon the said demised premises to reenter and the same to repossess and enjoy as in his and their first and former estate AND the said Edmund Nurse for himself his heirs executors and administrators doth covenant promise and agree with and to the said Robert Barber his heirs and assigns in manner following videlicet That he the said Edmund Nurse his executors administrators or assigns shall and will during the continuance of this demise well and truly pay or cause to be paid unto the said Robert Barber his heirs and assigns the said yearly rent or sum of five shillings hereby reserved on or at the days or times hereby appointed for payment of the same and that without any deduction whatever AND the said Robert Barber for himself his heirs executors administrators and assigns doth hereby covenant and agree with the said Edmund Nurse his executors administrators and assigns That he the said Edmund Nurse his executors administrators and assigns truly paying the rent hereinbefore reserved shall or lawfully may have hold occupy and enjoy the said premises hereby demised or intended so to be and every part of the same for and during the continuance of this demise without any let suit trouble action or disturbance whatsoever of the said Robert Barber his heirs or assigns or any other person or persons rightfully claiming or to claim by from through under or in trust for him them or any of them AND LASTLY it is hereby mutually covenanted agreed declared and understood by and between the said parties hereto that it shall and may be lawful to and for the said Edmund Nurse his executors administrators and assigns at the end or other sooner determination of this demise to pull down dissect remove and carry away the said Wind Corn Mill and premises erected and built and now or which at that time may be erected standing or being upon the said demised piece of ground and to use appropriate and apply the same to and for his and their own use and benefit as his and their own proper goods and chattels without any let suit molestation disturbance or interruption of from or by the said Robert Barber his heirs or assigns or any of them He the said Edmund Nurse his executors administrators or assigns making good any damage to be done to the said demised ground by the exercise of such privilege PROVIDED ALWAYS that nothing on or in the last mentioned covenant contained shall extend or be construed to extend to defeat or prejudice the right of the said Robert Barber his heirs or assigns to distrain detain or otherwise secure the said Wind Mill and premises or the materials thereof for nonpayment of the said yearly rent or any arrears thereof which may be due under this demise at the time of taking down removing and carrying away the same as aforesaid IN WITNESS whereof the said parties to these presents have hereunto set their hands and seals the day and year first hereinbefore written. 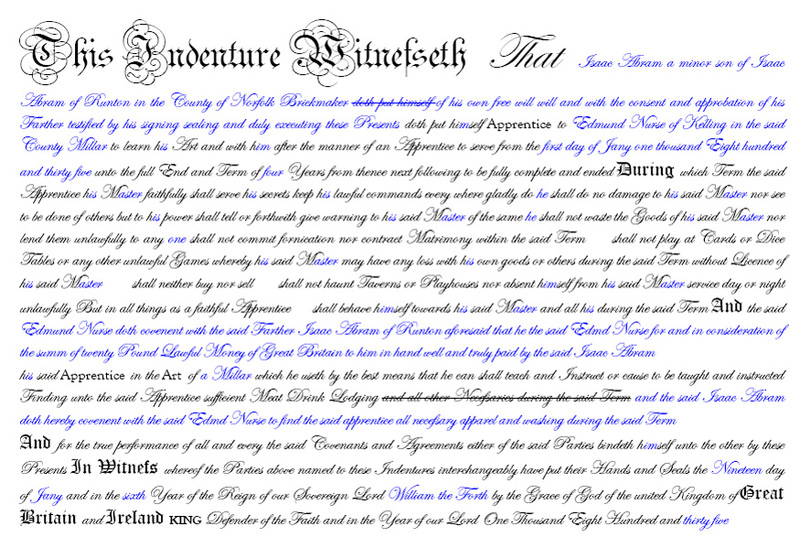 The text in black was part of a printed parchment form and the text in blue was hand written on that form. I have preserved the spelling errors and the parts of the printed form that were crossed out! In 1849 a large faction of the Nurse family emigrated to Australia. They left Gravesend, Kent, on the Statesman on 1st November 1849 and arrived at Port Adelaide, South Australia, on 12th February 1850. Those that travelled were: Edmund Nurse and his wife Elizabeth Platten Nurse (née Barber) and their 6 other surviving children, Robert Barber Nurse, Edmund James Nurse, John Platten Nurse, James Nurse, Benjamin Barber Nurse and Sarah Nurse. Isaac Abraham and his wife Elizabeth Barber Abraham (née Nurse). At some point between 1871 and 1881, Robert Lewis left the employ of James Platten Nurse and went to work at Harpley_towermill having been at Kelling for at least 10 years. A fairly large house, detached and standing well back on the other side of the road, was occupied by Jimmy Nurse and his wife. He was a very old man who in his earlier days had the running of the now-demolished windmill. On odd occasions one would see him shuffling along the street; unable to lift a foot from the ground, he could only move at a snail's pace. Like Mrs Bircham, his wife enjoyed her bottle of stout and could be seen on most days trotting down to the pub, the empties clinking in her bag. There was a fatal accident at Kelling yesterday afternoon, when George Gidney, aged about 55 was crushed by the collapse of a buttress of Kelling Mill. It appears that Gidney and Albert Woodhouse, both employed on Mr. Ronald Deterding's Kelling estate, were undermining one of the buttresses of the mill to get bricks for estate use. The mill, of which only the buttresses remain, was built about 200 years ago. Gidney, apparently called to Woodhouse to "look out," but was himself unable to avoid a mass of masonry about 7 ft. by 5 ft., which fell, pinning him to the ground. His companion ran to the village to get assistance and Police-constable Barnard and others were speedily on the spot and dug the man out. Dr. A.S. Hendrie, who had been summoned from Holt, could only pronounce life extinct. Gidney leaves a widow and grown up family of two sons and two daughters. 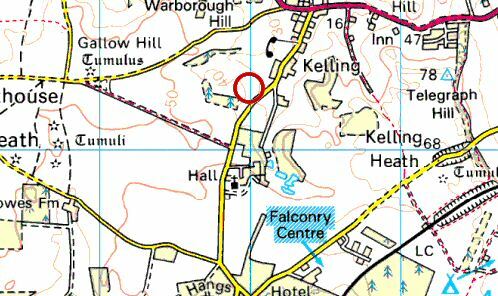 The inquest will be held at Kelling Arms at midday on Saturday. Killed By Fall Of 200-years-old Buttress. A verdict of accidental death was recorded by Coroner W. J. Barton at an inquest on Saturday at the Kelling Arms on the body of George William Gidney, aged 55, of Kelling, a bricklayer, employed on Mr. Ronald Deterding's estate at Kelling. As reported in the later editions of last week's "Norfolk Chronicle," Gidney was crushed to death by the sudden fall of a buttress with the aid of a ratchet cable-apparatus which is used in the felling of trees- but they found that the cable had been lent out, and Gidney decided to get the buttress down by undermining its foundations. Evidence of identification was given by a son-in-law, Harold Arthur Newland, of the Street, Kelling, a gardener. Dr. A.S.Hendrie, of Holt, said that shortly after 3 p.m. he received a call from Mr. Deterding asking him to go to the Old Mill, Kelling, where there had been an accident. He arrived there at 3.10 and found Gidney lying dead at the Mill. He made a superficial examination, and it was obvious his neck had been broken and his chest severely crushed. He imagined that death was instantaneous. Mr. Frank Alexander Newall, of Beck House, Kelling, estate agent for Mr. Ronald Deterding, said that at 1 p.m. Gidney had finished the job he was on and went to him for instructions as to future work, and witness told him to demolish the buttresses of the Old Mill. They discussed the best way to get them down, and witness suggested using a ratchet cable, which was kept at the Hall. Unfortunately this had been lent out so was not available. Gidney therefore decided to undermine the buttresses and fell them as one would a tree. The next thing that witness heard was that Gidney was dead. Gidney was an experienced man and had been working on the estate for a year. The mill was an old windmill and was about 200 years old. Only the four buttresses remained. Sergt. Leach (representing the Norfolk Constabulary): When you gave Gidney his instructions did you know that the ratchet was not at the Hall? If you had known he intended undermining would you have allowed him to do it? Gidney was an experienced man at his work, and I think that if I had known what he intended doing I should have left it entirely to him. Albert John Woodhouse, The Street, Kelling, labourer, said he and Gidney were told to get a ratchet cable from the Hall and demolish the buttresses, but at the Hall they were told that the cable had been lent out. Gidney therefore decided to dig the buttresses out. They started at 2.30 to dig them out and dug a square hole about 2ft. down and could then see the bottom of the buttress, so they started undermining the buttress. They had gone about 18 inches underneath when, about three o'clock, Gidney shouted "Look Out!" "I scrambled up the hole," said witness, "but the wall had caught Gidney. The way he had to come out was harder than what my way was. When I got out and looked round I saw that the wall was on top of Gidney. Both shovels were buried up, so I tried to scratch the stuff away, but when I looked at his face I saw he was dead. The wall was over his shoulders and he was squashed. I couldn't do anything, so I went for help. Witness added that he had never done exactly that sort of work before, but before he came to Kelling he had worked in the coal mines. William John Dewing, of Kelling, a labourer, said he heard of an accident at the Mill and on going there saw Gidney lying under the falling buttress. He looked as if he was dead, and he helped to get him out. P.C. Barnard said that at 3.15 he was told of the accident, and he went there. The buttress was 7ft. 6in. high by 4ft. 6in. wide. Beside was a trench, in which was Gidney with the fallen buttress on his shoulders. The trench was about two feet deep. While others propped up the fallen buttress witness dragged him out, but he was dead. Mr. T.D.Savoury (Messrs. Butcher and Andrews) for Mr. and Mrs. Ronald Deterding, Mr. C.B.Hill, (Messrs. Hill and Perks) for the insurance company, Sergt. Leach and Mr. Newall expressed sympathy with the bereaved family. The 1901 census listed Mary Nurse aged 87 and a widow as living at No. 74, next door to James Platten Nurse. 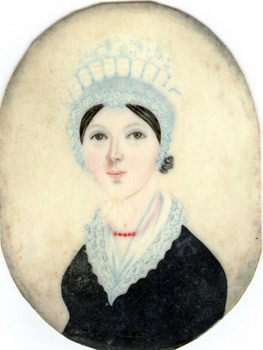 James Nurse snr had married Mary Platten of Wood Norton in 1835. James P. Nurse jnr was living at No. 77. By this time he was 34 and working as a farm labourer. 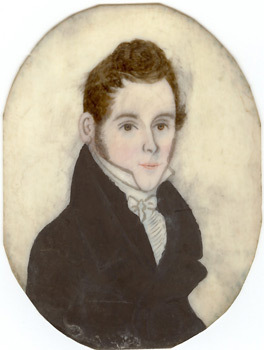 He was living with his wife Annie and 2 year old daughter Sarah. Were Edmund and James Nurse, 1836 - 1879, the sons of Edmund Nurse at Weybourne, 1790, 1791 and 1802 - probably at the watermill?